Last year we launched a ClusterControl integration with chatrooms. We made a Hubot based chatbot, called CCBot, to make your database tier accessible from your company wide chat! The chatbot integrates our CMON backend API within the Hubot framework, and this opened up the ability to interact with ClusterControl via the chatbot. This could be very beneficial for companies that rely on close collaboration between development and operations, like DevOps, as this enables all users in the same chatroom to use the same interface to the company’s database infrastructure. With the availability of the ClusterControl command line client (CLI), we also have a new and improved CCBot, that has a full integration with the CLI. That means that any functionality present in the CLI is also available in your CCBot enabled chat! The CCBot installation is a straightforward installation that we described in our CCBot introductory blog post. 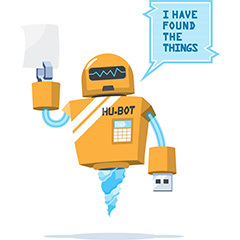 CCBot depends on the Hubot framework, which in itself depends on Node.js. Once Node.js has been installed and the CCBot has been checked out from the public CCBot Github repository, all other dependencies will be resolved automatically by npm. The newly added CLI support will be immediately available as well. The ClusterControl CLI will automatically be installed on new installations of ClusterControl 1.4.1 and higher. You can also install it manually on remote hosts (other than the ClusterControl node).On the Severalnines Command Line Interface GitHub repository you can find installation instructions for your specific operating system. Note that the CLI is compatible with version 1.4.1 and up. After installing the command line interface, a new user has to be created for CCBot under the user that runs CCBot. This really depends on how you have set up your hubot environment, but typically is the root user. This user will then be used by CCBot to interact with ClusterControl via the CLI. An existing user can be reused, however it will be easier to revoke access from a separate CCBot user. s9s user --create --cmon-user=ccbot --generate-key --controller="https://localhost:9501"
Then after creating the user we need to modify the config file in .s9s/s9s.conf in the homedir of the user that runs Hubot. Modify this file and set the controller_host_name that runs the ClusterControl backend cmon. If you have installed CCBot on the same host as ClusterControl this will be localhost, otherwise you need to sepecify the hostname of the ClusterControl host. Also set the controller_port to 9501 and enable rpc_tls. If the output is similar to the picture below, the .s9s directory hasn’t been created or Hubot is running under a different user than you have created the user with. backup - to view, create and restore database backups. cluster - to list and manipulate clusters. --wait                     Wait until the job ends. --log                      Wait and monitor job messages. --schedule=DATE&TIME       Run the job at the specified time. --list                     List the maintenance period. --create                   Create a new maintenance period. --delete                   Delete a maintenance period. -u, --cmon-user=USERNAME   The username on the Cmon system. --cluster-id=ID            The cluster for cluster maintenances. --nodes=NODELIST           The nodes for the node maintenances. --full-uuid                Print the full UUID. --start=DATE&TIME          The start of the maintenance period. --end=DATE&TIME            The end of the maintenance period. --reason=STRING            The reason for the maintenance. --date-format=FORMAT       The format of the dates printed. --uuid=UUID                The UUID to identify the maintenance period. art [4:15 PM] @ccbot s9s cluster --create --cluster-type=galera --vendor=percona --provider-version=5.7 --db-admin-passwd='pa$$word' --os-user=vagrant --cluster-name='galera01' --nodes="10.10.37.11;10.10.37.12"
Job with ID 1 registered. 10.10.37.11: Check and disable AppArmor. 10.10.37.11: Checking SELinux status (enabled = false). Job finished, all the nodes have been added successfully. Status: All nodes are operational. Job with ID 2 registered. Job with ID 3 registered. art [4:14 PM] @ccbot s9s backup --create --cluster-id=1 --nodes="10.10.37.12"
ccbot [4:22 PM] Running [s9s backup --create --cluster-id=1 --nodes="10.10.37.12"
Job with ID 11 registered. There are a couple of caveats with using the command line interface under the Hubot framework. First of all, there is no support for webhooks with the CLI. Normally you would use this to send commands or status updates from an external source to a Hubot based chatbot. Since the command line interface is decoupled from CCBot and keeps no state, it will be difficult to integrate webhooks for this functionality. This means all status updates need to be requested from ClusterControl using the job list command. Also in the initial version of CCBot, we added the ability to run backups. Once a backup had been scheduled as a job, a new thread would be started to monitor the progress of the (backup) job and report updates back (privately) to the user who initiated the backup. The command to do this is still available in CCBot and fully functional. However if a backup gets started via CLI, no new thread will be started as it has been started using the command line. This means the user initiating the backup will not get direct feedback and has to request status updates via the command line client. Another limitation is that the CLI has been implemented as a single command. This means that if you integrate CCBot in an existing chatbot with user authorization, it would be difficult to disallow certain specific commands that you would send to the command line client. Depending on your needs, you would be able to create additional proxy commands for the CLI and allow/disallow them per user. These boundaries are present in this initial launch of the CCBot CLI version, but we are working hard to overcome them in the next version. The command line client is really easy to use, and if you are very accustomed to the command line of your own operating system, it will be a great addition. However not everyone has access to the hosts with the command line client installed, and allowing external connections sending commands to ClusterControl may not be in the best of interest in terms of security. The addition of the command line client to our chatbot, CCBot, will open up the command line client for users that do not work regularly with a command line. It allows them to send commands to ClusterControl that these users normally wouldn’t have had access to. We’d love to hear your thoughts on this. 2018 saw a rise in PostgreSQL, a boom in containizeration and increased adoption of DevOps in the enterprise. What will 2019 hold? This blog details some industry predictions as well as ones from the Severalnines team.